When building up or out is out of the question, go down under with a basement addition. If you love your home, but it’s become a tight fit, a basement addition is an increasingly popular option for Coastal East Bay homeowners constrained by lot space, and/or permitting issues. Moreover, a basement addition provides a way to double your home’s livable square footage - never a bad thing when you’re ready to sell – and ranks near the top of home remodeling projects for yielding the best return on investment. With dozens of projects in our portfolio, HDR Remodeling has extensive experience in basement additions and home excavations. We’ve compiled a Top 10 List of Frequently Asked Questions to familiarize you with the cost, process, caveats, and considerations crucial to adding a basement to your East Bay home. 1. What Does a Basement Addition in the Coastal East Bay Cost? An 850 sq.ft. basement addition will cost anywhere from $600 - $800 per sq.ft. However, as with any addition, lessens your home’s per square foot price assessment - while increasing overall space. With most Coastal East Bay homes selling at approximately $1,000 per sq.ft., a basement remodel could add significant value when it’s time to sell. 2. What kind of permits do I need for a basement remodel? Depending on how you intend to use your newly acquired space – and environmental considerations determines what kind of permit you’ll require. Let’s start with the easiest first. An accessory structure permit allows you to add or convert a basement for use as a storage, office, or studio space. The Accessory Structure permit only allows for a half bath, e.g. toilet and sink, but no shower, and places restrictions on heating options. Permitting for an Accessory Dwelling Unit (ADU) is a little more complicated, and is intended for basement remodels that create a separate living space, e.g. a standalone space with its own entrance, kitchen and bathroom facilities, to be used as a rental unit, or ‘granny flat’ for family members, or future living in place needs. The most difficult building permit to obtain is for home Additions. What differentiates an Addition permit from an ADU permit is the former adds square footage to the existing living space of a home, such as bedrooms and bathrooms that are accessible via a staircase connecting the upstairs and newly created basement – not through a separate entrance. 3. Will my basement leak? Most properties in the East Bay suffer from some type of drainage issues. To mitigate the risk of leakage, HDR Remodeling employs French drains – gravel-filled trenches with perforated pipes used to divert groundwater away from subterranean rooms, and out to the street or approved City systems. The shape of the excavation site is also designed to divert water away from the house before being pumped out. Both systems employ electric pumps with battery back-ups. 4. Will my basement feel like a dungeon? Many Coastal East Bay homes built during the early 20th century were designed with elevated landings or porches, or into hillsides with significant slopes - meaning there’s already crawl space beneath the home. We take full advantage of the area above the foundation’s grade or slope to accommodate plentiful natural light and window options, while bathrooms and storage areas are located where natural light is less necessary. Additionally, heated flooring and other ambiance-enhancing practices are employed to minimize a basement’s “dungeon-y” feel. For homes with entirely subterranean basement remodels, our approach is to bring natural light in through skylights above stairwells, and lessen the number of walls to create open areas. Additionally, we use high-end finishes and trims to lessen the subterranean feel, and create a space people will enjoy. 5. 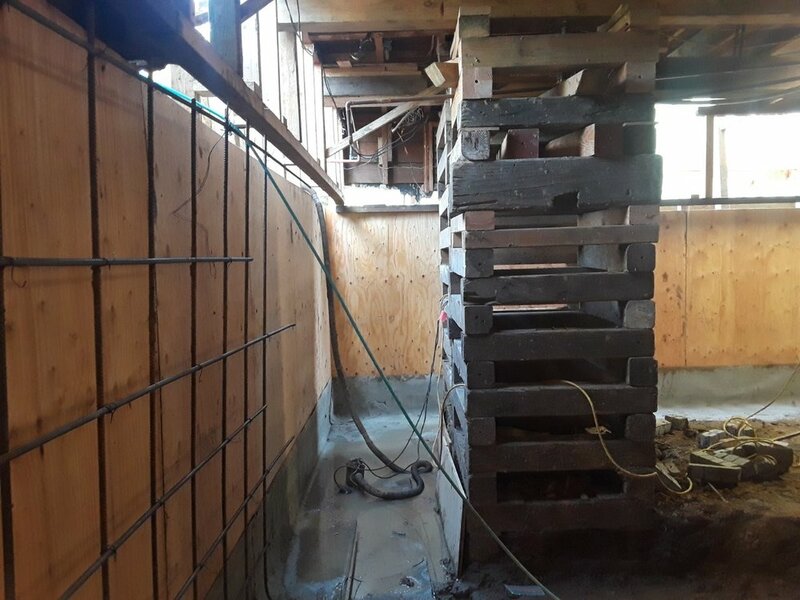 Can I turn my basement addition into an ADU? YES! Click here to learn more about building ADUs with HDR Remodeling. 6. Do I need to notify my neighbors? It varies from city to city, but we highly recommend communicating with your neighbors regarding the impact (noise, traffic, dust) a construction project can have on a neighborhood’s environment. 7. How long does a basement remodel take? 8. Will I have to move out? No, you can continue to live in your home during construction, with a couple of caveats. There are costs associated with staying in the house during a remodel - maintaining water, heat, and electrical systems, but generally these outweigh the cost, and hassle of moving out. 9. Is it cheaper to excavate or lift the house? It’s dependent on existing conditions but both options have their pros and cons. From a permitting perspective, most cities prefer excavation projects primarily to help maintain the architectural language of the neighborhood, and preserve existing views. 10. What are the restrictions on floor-to-area ratio, lot coverage, and property lines? A basement remodel does not affect your lot coverage or property lines. For homeowners with small lots, height limitations or zoning restrictions, a basement excavation is the only solution to expanding a home’s living space. Interested in pursuing a basement addition? Learn more about the requirements in the Coastal East Bay cities we service, or contact HDR Remodeling for a free consultation. Oh So Trendy Bathroom Design Trends!